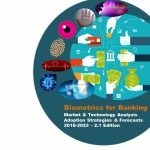 The 2.1 edition of Biometrics for Banking; Market & Technology Analysis, Adoption Strategies & Forecasts 2018-2023 is a 260 page analyst report that provides detailed analysis of the market and adoption of biometrics for banking. This report is available at $5,000.00 for a Enterprise license. Please contact us on sales@goodeintelligence.com if you require further information. The 2.1 edition of this report offers the most comprehensive investigation and analysis of current global adoption for biometrics across all aspects of banking. The market analysis includes the key drivers and barriers for adoption, interviews with leading stakeholders, technology analysis with review of key biometric technologies and profiles of companies supplying biometric systems to banks plus forecasts (regional and global) for users and revenue within the six-year period 2018 to 2023. The September 2018 updates (2.1) including new content on biometric banking models including an analysis into device-based and cloud-based, Biometrics Identity as a Service (BIDaaS), biometric models and forecasts for user adoption and revenues for device and cloud-based biometric banking. The report is the first of three reports in a series investigating the market for biometrics in financial services. In addition to banking, the series will include payments and mobile reports. The Goode Intelligence Biometrics for Financial Services series is available to purchase in the bundled price of $12,000.00 (a saving of $3,000.00). •	use a combination of biometric modalities (face and voice for instance) to initiate money transfers when accessing web-based eBanking services. Biometric vendors are experiencing tremendous growth on the back of the escalation of consumer-led adoption of biometric authentication. The adoption for banking purposes is a major contributor to this growth and Goode Intelligence forecasts that by 2023 it will contribute US$4.8 billion in revenue for companies involved in delivering biometric systems to the banking industry. Biometrics for banking is increasingly a vital part of a bank’s toolkit in the never-ending task of reducing financial fraud and ensuring that customers can conveniently prove their identity when accessing bank services – resulting in smarter identity verification and authentication for the customer-first bank. This comprehensive report includes a review of current global adoption, market analysis including key drivers and barriers for adoption, interviews with leading stakeholders, technology analysis with review of key biometric technologies and profiles of companies supplying biometric systems to banks plus forecasts (regional and global) for users and revenue within the six-year period 2018 to 2023. Companies referenced in this report include: Access Softek, AimBrain, Al Rajhi Bank, Ally Bank, Amazon, American Express, Apple, Applied Recognition, ARM, Atom Bank, Axis Bank, Aware Biometrics, Banco Bradesco, Banco Santander, Bank of Lanzhou, Bank Muscat, Bank of America, Bank of China, Bank of China Hong Kong, Bank of Korea, Banco Popular, Bankmobile, Barclays, BehavioSec, BioCatch, BIO-key, Biometrics Signature ID, B-Secur, British Bankers Association, Brightek, Cairo Amman Bank, Cardtech, CESG, Certibio, Cifas, China Construction Bank, City Bank of Texas, Cognitec, DAB Bank, Daon, DARPA, Deutsche Bank, Diamond Fortress, Diebold Nixdorf, Digital Insight, EarlyWarning, Encap Security, EPILEDS, EPISTAR, Epson, Ernst & Young, ECB, eyeLock, Face++, FFIEC, FCA, FFA, Fingerprint Cards, First Bitcoin Capital Corp., Fotonation, Fujitsu, Garanti Bank, GBG IDScan, Gemalto, Getin Bank, HID Lumidigm , Hitachi, HYPR, Idair, IDEX, Idology, IEEE, InFocus, ING Bank, iProov, IrisGuard, İşbank, ITCARD, JP Morgan Chase, Jumio, KeyLemon, Lamassu,, Macau Monetary Policy, MasterCard, Microsoft, Mitek Systems, MoneyOnMobile, Monetise, Mountain America Credit Union, Morpho, M2SYS, Natwest Bank, NICE, NIST, NCR, NEXT Biometrics, Nok Nok Labs, Noris Bank, NTT DoCoMo, Nuance, Nymi, OCBC, OCC, OKI, Onfido, Pindrop, Planet Cash, Princeton Identity, Qualcomm, RBS, Redrock Biometrics, Royal Bank of Canada, Royal Oman Police, RSA Security, Samsung, Samsung SDS, SAMCO, SayPay, Smartmetric, SmilePass, St Georges Bank, Saque e Pague, Sonavation, Synaptics, Tangerine Bank, Tencent, The FIDO Alliance, The Natural Security Alliance, Trustonic, Turkiye IS Bankasi, TypingDNA, USAA, US Federal Reserve, Vasco/OneSpan, Verint, VISA, VoiceTrust, VoiceVault, Westpac, Wincor Nixdorf, ZTE, Zwipe.